Be the first to share your favorite memory, photo or story of Honorio. This memorial page is dedicated for family, friends and future generations to celebrate the life of their loved one. 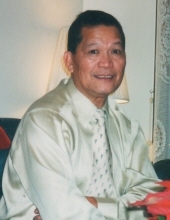 Honorio E. Apilado, age 77, of Forest Park; beloved husband of Elizabeth; loving daddy of Ron (Leslie), Aaron and Elisha-Rio Apilado; cherished Lolo of Julian and Lucas Apilado; dear brother of 5. Visitation Sunday February 3 from 3 to 8 p.m. at Drechsler, Brown & Williams Funeral Home, 203 S. Marion St., Oak Park. Interment private. To send flowers or a remembrance gift to the family of Honorio E. Apilado, please visit our Tribute Store. "Email Address" would like to share the life celebration of Honorio E. Apilado. Click on the "link" to go to share a favorite memory or leave a condolence message for the family.